Why not? Draws crowds, disseminate information, entertain, and create a unique giveaway all rolled up into one... Provided by one professional and energetic entertainer – Magical Balloon-dude Dale. 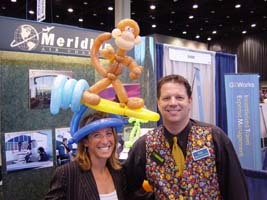 Magical Balloon-dude Dale takes trade show traffic building to a new level. Dale combines entertainment, provides product/service or slogan information while performing incredible balloon twisting art which draws both attention and attendees to your booth and creates a unique giveaway that will be displayed and cherished by trade show attendees and exhibitors. Magical Balloon-dude Dale’s salesmanship and balloon entertainment skills will keep people glued to your area, thus giving your sales force time to interact with the attendees, qualified leads, create trade show booth envy with your trade show competitors. Dale will work with your trade show marketing team to develop a traffic building program that will make your trade show booth the talk of the trade show. WARNING: The possession of Magical Balloon-dude Dale’s balloon creations will produce excellent comments from your peers. Be prepared - accolades are coming! 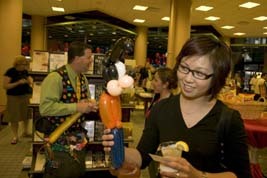 Magical Balloon-dude Dale is promotional entertaining at its best! Call (708) 744-0234 or email Dale now!